You know your luggage rocks when the doorman outside of the Bryant Park Hotel in New York City wants to take it for a spin. No joke, when my husband stepped out of a taxi cab, the guy who greeted him grabbed the handle of his rollaboard, took a few steps towards the revolving doors, and then stopped dead in his tracks. “Nice,” he said, rolling it back and forth over the cement as if it were a lawnmower. This from a guy who comes in contact with a lot of luggage, a lot of really nice luggage, on a daily basis. Then he spun it around in circles like a skater on ice. If you’re not a fan of Tiger Woods or golf in general, you’re probably thinking, Club Glove? I thought the same thing after a pilot contacted me to tell me about the line of luggage his friend had designed specifically for flight crews. Turns out Club Glove, the number one travel equipment in golf, is no longer just for golfers. It’s for flight attendants, pilots, and passengers, too. Makes sense since the CEO and owner of the company, Jeff Herold, is also a private pilot. He’s been flying since 1997 and many of his friends are commercial pilots and flight attendants. The only bad thing I can say about Club Glove is this. It’s not crew luggage. At my airline luggage is part of our uniform. This means we can only use a certain brand, and I’ve been quite happy with my 22″ Travelpro suiter for a long time. Because of this I was hesitant to try it out, but after the pilot assured me it was the best there is out there, I decided to give it a go. 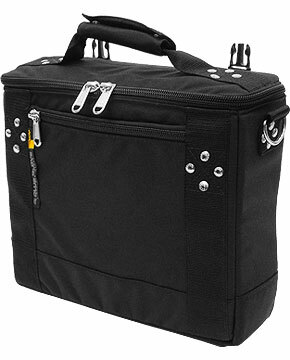 Although I couldn’t use the 23″ Club Glove “carry on” bag at work, I could take with me on vacation – twice. I even allowed my husband, a frequent flier who travels over 100,000 miles a year on business, to borrow it after a wheel on his beloved, ten year-old, Samsonite popped off. Not only did The Husband come home raving about the bag, and he’s not one to be easily impressed, a client of his ordered one just like it. What makes the bag so great? It doesn’t roll, it glides, like butter. After experiencing such a smooth roll, it wasn’t easy going back to what can now only be described as a drag. Sorry Travelpro. At 8.8 pounds (the same weight as my Travelpro), it’s light weight and easy to lift into an overhead bin. That’s important considering I spend half my life on a plane and have no desire to have back surgery. At first glance the Club Glove bag appeared to be smaller than my Travelpro, but I was able to fit just as much inside. Because it’s thinner (and taller) than my crew bag, it rolled down the aisle without knocking into any seats. Of course the height of the bag was an initial concern. It’s an inch taller than most rollaboard bags. But by stowing it with the wheels facing out, instead of wheels in first, it fit nicely into a coach overhead bin on both the Super 80 and 767 aircraft. The hard back makes the suitcase feel sturdy, but the soft front allows for squishing action if getting the bag into a tight space becomes an issue. I’m not the most organized person in the world, but the clothing organizer bags that came with the flight crew set made it easy to stay, well, organized! A first for me. My favorite thing about the bag was how well the wheel base worked in the snow. It was like a sled! The VLK flight bag impressed me the most. I could not believe how much I could get inside what at first appeared to be a tote bag that would never in a million years work for me based on the small size! Yet I was able to fit everything I needed inside, and then some, including a full size laptop computer AND my makeup bag, as well as a couple of magazines, a book, my wallet, a bottle of water – you get the picture. This is why The Husband and I now refer to it as the magic bag. Seriously, there’s no better way to describe it. How much do I like Club Glove luggage? So much I’m thinking about ordering the Train Reaction set (rollaboard, tote, rolling duffle) for my in-laws before their next big cruise. But only if they agree to let me borrow it first! There are four different flight crew sets to choose from. 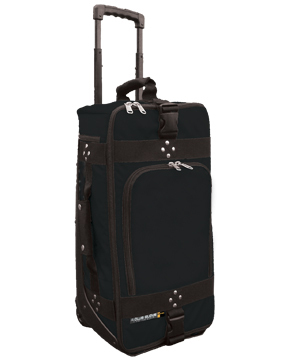 Each includes a carry on bag (rollaboard), gear bag, flight bag (tote), two clothing organizers, and travel kit, along with a 5 year NQA (no-questions-asked) warranty for $499. Not bad for a quality, light weight, dependable product! It’s the only line of luggage still made in America. Sweet Baby Jesus those bags look amazing!! If *only* they had a pocket on the back of the suitcase to hold out blasted handbooks, I would actually contemplate ordering one…. Heather you can’t beat the Club Glove Luggage. My wife and I each have one of the carry-ons (the “carry-on” for her and the “piggy back” for me). I also have one of their large rolling duffels. I literally don’t touch the rest of my luggage any more. Once you hook it together in the “train reaction” set, it self balances so you are only pulling not holding the bag up and pulling. Even better are inline skate wheels that the use. I can pull my suitcase and carry-on through the airport with two fingers.